A breeding kennel should have a Mission Statement to ensure that they are always on the cutting edge of genetic sciences, and that they set, and meet, their specific breeding goals. Our aspiration, like many hunters, is to hunt behind the best possible dogs we could acquire from any of the sporting breeds or any breeder. This is the passion that pushes us to maintain the highest standards in our program. At Cedarwood Kennels, it has always been our profound aspiration to produce the absolute best and most versatile dog, not only for the present, but also for the future of the Pudelpointer breed. Our primary focus is to maintain the clownish personality and devoted affection that won our hearts back in 1975. First and foremost, the companionship of this breed is what exclusively sets it apart from all other sporting breeds. Secondly, we strive to maintain the versatile hunting qualities that have secured the Pudelpointer as NAVHDA’s number one breed for the past 40 years. The average natural ability score for the >300 tested dogs from Cedarwood Kennels during the past 25 years is 104 points. This is not by luck; it is a product of our mission statement. The average natural ability score of the breeding stock used at Cedarwood Kennels is 110 points; this is the average of all the dogs ever used for breeding at our kennel and this is what separates our kennel from all others. Setting the bar to this height and using breeding advise from many other successful breeders, trainers, and dog enthusiasts such as Bob Wehle, Bill Tarrent, Jim Reed, and Tom Gooding our dogs are paving the way for generations to come. Cedarwood Kennels is committed to producing excellent personal gun dogs that can duplicate as a wonderful family companions. These are not mutually exclusive goals -- a Pudelpointer should have a calm, affectionate disposition within the home, and should display this same affectionate behavior toward everyone they encounter. However, the breed should also have the ability to change gears when in the field or marsh to display the desire and prey drive necessary to earn them that number one spot among NAVHDA’s versatile breeds. 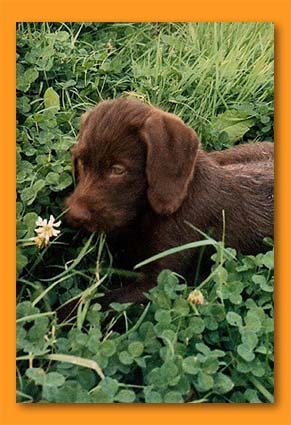 A well-bred Pudelpointer should be a sporting companion that a hunter never loses contact with in the field. The dogs should adjust their range in the field to maintain visual contact with the handler. 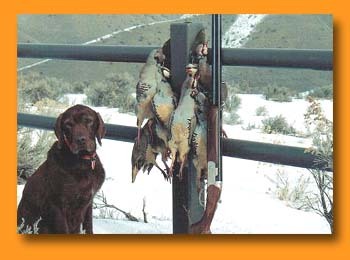 This cooperative search pattern finds the dog hunting for the gun, rather than the gunner hunting for the dog, as is often the case with so many breeds. Pudelpointers are natural pointing dogs with natural instincts to point, track and retrieve any and all game birds. The breed has an intense fiery toward waterfowl. This intensity, along with the breed’s love of water, makes them a sound water dog in the months of December and January, rivaling that of the Labrador Retriever when the waterfowling conditions get tough. It has always been our goal at Cedarwood Kennels to provide sporting dogs that can hunt the upland game birds of North America equaling the prey drive of an English Pointer, but in a cooperative and bidabable manner; coupled with the ability to retrieve in icy water conditions equal to the Labs, Goldens and Chessies. These dogs must also have the intelligence and cooperation required making them the best possible canine citizen in the home environment. To maintain the genetic line of Pudelpointer that has given our kennel the high ranking it has today, we line breed our dogs while maintaining the motherline that we created from a very special Pudelpointer named Cedarwood’s Calendar Girl. “Cally” and Cedarwood’s Blaze rewrote the NAVHDA scores for the breed by producing many exceptional performers and an average natural ability score of 108 points from 7 different litters. We have seven dogs in our breeding program out of Cally; six females and one male. When this motherline is line bred, the progeny is very predictable. Today, a grandson of "Cally" is again rewriting the NAVHDA accomplishments for this breed and possibly all the versatile breeds. Cedarwoods First Offense (aka Tukr) has over 100 offspring that have been NAVHDA tested in Natural Ability with an average (mean) score of 108 points for those dogs. 80% of these dogs earned a Prize I making Tukr this breed's alltime top influencer when improvement and consistancy are discussed. Examination of Tukr's pedigree shows 29 out of 30 dogs as ancestors earning a NAVHDA Prize I. With a pedigree as strong as this, it's no wonder he stamps only excellance into his progeny. Also, today's Cedarwood pedigree's show a "nick" that was performed with our Czech import Hery Ze Strazistskych Lesu (aka Hery). This dog when bred to a female pudelpointer out of Cally gave us an outcross breeding proving the necessary genetic cross that is so valuable to a linebreeding program. Hery is half Czech and half German and is without question the smartest and most trainable dog one could find. His genetic diversity of having the very best from the Czech Republic and also Germany is what all breeders should be attempting to attain from a solid mission statement governing their breeding program. Just look at Cedarwoods Quick Release, Cedarwoods Storm Trooper, Cedarwoods Trophy Playmate, and Cedarwoods Electric Playmate on our Breeding Stock page to observe the genetic "nick" that we are speaking of. We are now beginning to breed our 2nd Czech import, Lord Ze Strazistskych Lesu. We hope to see the same favorable results that were observed with Hery's breedings. At Cedarwood Kennels, we always expect each breeding to produce our next high-quality future field performers. A young superstar recently joined us in Cedarwoods Pin Up Playmate (aka Hemi). Hemi was tested in a NAVHDA Natural Ability test at 4 months of age earning a Prize I, qualifying her as the youngest Prize I Pudelpointer in the breed's history. She also earned a Prize I in Utility before her 2nd birthday. She has produced 2 dogs for us that will undoubtadly play a significant role in future years: Cedarwoods Rerun as a stud dog; he is a very powerful performer. Cedarwoods Mtn Huckleberry is our latest hopeful. His pedigree shows Tukr as his grandfather on his mother's side and also Tukr as his great grandfather on his sires side. If a horse breeder was looking for the next Kentucky Derby winner, he would have Secretariet on the colts pedigree at these same two locations. Huck's pedigree is from 25 years of work and is very special for the pudelpointer's future. Having both his parents as Versatile Champions doesnt hurt either. Check out these dogs on our Breeding Stock page and click on their pictures to read more of each individual dog. All of the breeding dogs at our kennel are personal hunting companions and owned by Cedarwood Kennels and hunted regularly while sharing the comforts of the home. In other words, we have no breeding dogs soley for breeding purposes only. Only 4 of our pudelpointers live with us here at Cedarwood Kennels; the other 40 some dogs live with family and friends here in Boise. With this arrangement, we can honestly boast that every dog on our Breeding Stock page sleeps in a home every night, enjoying the fruits of family and not in a kennel. Bird hunting is the driving force behind our breeding program. We are found hunting grouse in September and early October. Ruffs, Blues, Sage, Sharptail, and Spruce are all native to our region and our dogs are excellent grouse dogs as their ability to shorten their range and maintain visual contact make them invaluable in the woods and prairie. Mid October through November is the best time for pheasants and local waterfowl. Here the dogs see a much more intense pace – different demands for today’s pheasant. December and January are the best months for Chukar, Hungarians, and Valley Quail. Here the dogs have to range out significantly more and stand their birds from extreme distances. These are also the two months that see the northern waterfowl entering our area. Our dogs are often seen during this period retrieving in the ice water of the Snake River in the morning and then searching the Chukar slopes in the afternoon. A typical hunting season sees me >100 days annually from September through January hunting wild birds.